The names Aaron Wall, Giovanna Villanueva, Peter Da Vanzo and Eric Covino have already made legend in the world of search engine optimization and internet marketing. In 2003, SEO Book was created, and since then it has become one of the most comprehensive go-to place for webmasters, business people and do-it-yourself specialists. SeoBook is not just a software developed for SEO, it also includes over 100 custom training modules, guides, privte forums and so much more. To even think that you could ever cover all the wonderful aspects of SEOBook in one review would be sheer madness. Nevertheless, I would like to highlight the most important tools which can be found in the suite. Like Moz, SeoBook offers certain free tools, as well as paid ones which are displayed at the navigation bar of their official page. Nevertheless, there are many other interesting public tools which can be found if you dig a little around the site. We would like to focus on the SEO for Firefox tools, as they are the trademark of SeoBook. 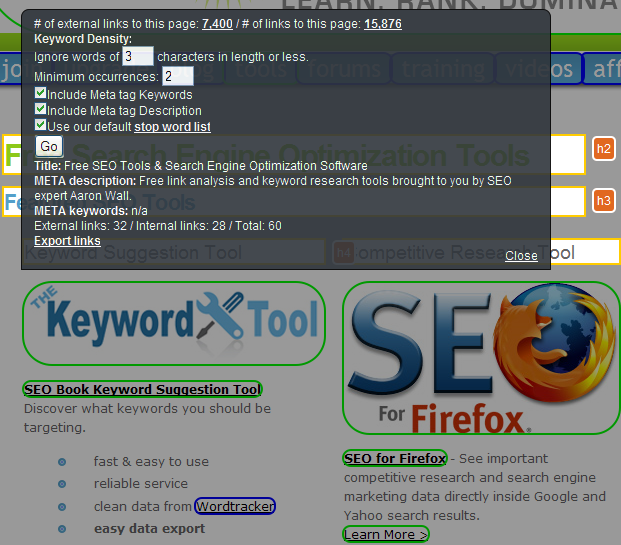 Before you start reading, please note that the SeoBook Toolbar is especially dedicated to Firefox browsers. Not that we have set the records straight, let’s see what this nifty software can do for you. If you put the best keywords tools together with a feed reader, a few competitive research tools, easy data export and a myriad of other tools you will get the SeoBook Toolbar. It is seriously that complex. Nevertheless, as complex as it may be, it will not slow down your browser, nor will it disturb you from your activities in any way. It is truly the only toolbar you will ever need (its only rival could be the MOZBar which still has a few glitches) because it combines all the SEO tools you will ever need. With it you will be able to quickly access page and site PR, site age, Indexed Pages, Site links, link count from Majestic Seo, Alexa Traffic Data, Sem Rush Traffic Data, Delicious links and many, many more. Why is it useful? It is true that it will not automatize the process of link-building but it will definitely help you create a firmer opinion about the site on which you would like to place your following links. In addition to this, it will provide you with competitive data, in order for you to always stay ahead of your competition. The SeoBook Toolbar is also equipped with certain buttons that will give you more detailed information on certain matters (eg. Archive, Compete.com and SEM Rush data). The SEO X RAY is a unique feature of the SeoBook Toolbar that will give you even more detailed information about the page that you are scanning. With it you can check meta description tags, meta keywords and titles without checking the source code. It will also display an external link count and other important information that might help you better understand SEO. These are only a few of the many features that are packed into one incredible SEO bar. If you are an expert in the field, an internet marketer, or enthusiastic entrepreneur, this software is a must-have because it gives you everything you will ever need for your online endeavors. · You start by entering your keyword in the keyword field. After you are done you can choose from a default 100 to 1000 results. The results displayed at the top of the page are the ones which are considered the most profitable for you. · From the Region/Country field you can choose where you want your query to be run, and this will give you a chance to increase your local authority. · The results will be displayed along with crawl dates, Yahoo and Majestic link counts. All in all, the Local Rank tool will give you comprehensive data related to keywords, and how you should use them. Nevertheless you will definitely need a little guidance to understand how things actually work, because they are quite complicated. Another tool that is only available for members is the Competitive Research tool, by far the most exciting and complex tool available in the SeoBook suite. SEO is all about the competition, and if you decide to stubbornly follow your own strategies without thinking about your adversaries, chances are that you will never achieve true success. For those who also do PPC work, this tool is an excellent choice, because it can significantly simplify marketing efforts. You have a search box in which you can insert a domain or keyword. For example, if you paste an URL you will be able to pull information only for that particular link. On the other hand, if you type in a keyword, you will see a list of URLs along with corresponding numbers. You will have to play around a bit in order to understand how things work. The CPC rubric stands for (coost-per-click) and it will determine your possible earnings. The Competition rubric will let you know how many people are trying to rank for the same keywords, and the Ave. Volume will tell you how many people are likely to search for that keyword. If you click the domain option you will receive more detailed information about Domain, Organic keywords, traffic, Adword keywords, costs and so on. In addition to this you will receive information about costs, CPC volume, value of #1 Rankings and so on. Are you confused? I would be too, but this data is vital for conducting competitive keyword analysis. The fun doesn’t stop here! There are a plethora of other functions that are awaiting discovery, but now is not the time to discuss them. All you need to know is that the time spent with this tool will increase the chances to create a successful link building campaign. The key is to stick to relevant rubrics, and not get lost in the enormous amount of data provided. Google Gadgets is powered by a light XML series of programs that will help you place interactive data inside web pages. The main components of this tool are Keyword research and Competitive Analysis Tool Gadget and the Link Analysis Gadget. In short, it will enable you to make use of all free keyword research tools, show you ways to search for backlinks, and find citations from authoritative blogs. In addition to this it extracts information from Digg, StumbleUpon and Wikipedia. The SEO world has evolved significantly in the past few years, and this means that you can no longer simply paste your link on obscure sites, or spammy directories. If you truly wish for your site to grow you should be willing to go all the way, and put some extra effort in your work. The Hub Finder tool works on the premise that sites that you link to, should also link back to you in order to preserve editorial integrity. To be honest I have yet to get the hang of things, but from what I can see Hub Finder has many benefits. First of all it uses Yahoo mainly, and it will give you detailed reports about which sites link to which. In other words, you will be able to find tons of linking opportunities with the help of co-occurring links. Once you are done you can save your data in a neat report. The only downside is the fact that you might get errors from time to time, as the tool is not yet fully functional. · Search Engine Ranking Checkers – Useful for determining how effective your internet marketing strategy is. The tools mentioned above are applicable in most cases, they are fast, and they promise to aid you in your link-building campaigns. The fact that they work on Firefox is another great thing, because Firefox is a great browser. SeoBook is without a doubt worth your time and money, and although the monthly subscription is a little expensive, it is truly worth the money. The daily subscription costs 10$, and the monthly one 300$. I know that it sounds like a lot, but with it you will gain access to so much more than SEO Tools. You cannot put a price on the expert advice, multiple guides, incredible information and private forums. To be honest, I think that you will get everything you will ever need to become a SEO expert if you subscribe to SeoBook.